What is the difference between a cosmetic dentist and a ‘normal’ or general dentist you may be wondering? Well a cosmetic dentist concentrates on the appearance, or aesthetics of the teeth and gums. There are many different options in improving the look and appearance of your smile. Dentists work hard in continuing and improving their knowledge with the newest techniques, materials and products available. Looking for Cosmetic Dentists in Melbourne? Contact Bond Street Dental to discuss what services they offer. The first cosmetic treatment a lot of people are interested in, and opt for as it is great value for money is tooth whitening. This lifts the shade of the teeth, making them whiter. This can be done 2 ways, with in chair whitening, with a concentrated application of whitening gel is applied by the clinician over the course of a 90 minute appointment. The other option is take home whitening kits. The clinician will take moulds of your teeth and make custom fit trays, like a very thin mouth guard. You are provided with the whitening gel and you whitening your teeth at your own pace at home. Both systems work very well and they also work even better when they are combined. A dental examination is required before the treatment is carried out, oral health is essential before this treatment can be considered, along with any type of cosmetic dentistry. There are many online, and pop up shop/ clinics available for whitening treatments. Also some beauty salons offer this treatment. This is not only illegal, it is unsafe. They are not dental professionals and are not trained to the correct standards to diagnose whether you a suitable candidate for this treatment, or have the dental knowledge of how and why the treatment can be used. 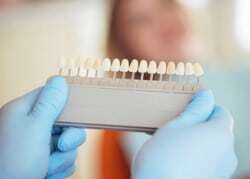 Composite resin, also known as tooth coloured filling materials. This is a common product used by dentists on a daily basis. It is made of Nano- particles of glass and plastic which is built up in layers. Each layer is set with a blue light. Composite resin restorations can be used for cosmetic dental treatments. They can be used to build up the front teeth for example. It is a non-invasive treatment as the clinician will only be adding to your teeth. This treatment can be used to change the shape of a tooth or teeth, it can also be used to close gaps in teeth. The benefits of this treatment are you get a good result which is also cost effective. There are a huge variety of different composite resins available in different shades and opacities. This used with the layering technique when placing the restoration gives a great natural result. The Ferrari of cosmetic dental treatments. Crowns and veneers that are used to improve the appearance of your teeth and are made from ceramic and zirconia. These materials are not only durable but they are the best replica for your natural teeth, with high lustre and high quality appearance. A consultation is essential and all the hard work is in the planning. Discussing with your dentist what you wish to achieve and the steps it takes to get there is a big part of the process. A wax up is used to demonstrate on a model of your teeth what the proposed treatment will look like, from this alterations can be made. Once you are happy with the wax up a prototype stage is used. The natural tooth / teeth are trimmed to shape– and please be aware there are risks involved in this. Removing natural tooth structure can have adverse effects. This is something your clinician will discuss depending on your dental health and history. Once the natural tooth is prepared, you will have temporary prototype crowns/veneers based on the choices made in the wax up stage. You will wear the temporary prototype crowns/veneers for a period of time and changes can be made to the temporary teeth until you are happy with the appearance.